There are many reasons why a cat scratches. Cats scratch to remove the dead outer layer of their claws, to mark their territory and to stretch and flex their feet and claws. It is normal for cats to scratch so you don’t want to discourage it. We all know that the couch, carpet or wood work are not acceptable spots. So offering them an acceptable place to scratch, such as a scratching post, is a great choice. Lets take a look at what cats like to scratch. They prefer objects with a nubby, course, or textured surface. A place they can really dig into with their claws. That's why your furniture is always a good spot in your cats mind. They usually scratch when they wake up, are excited about something, and when they want to mark their territory. Every cat has its own way that it likes to scratch. Some like to stand up on a upright surface while others like to stretch out against the floor with their butts in the air. No matter how or where they prefer to scratch, once you figure out their favorite spots, you can work to get them scratching in your preferred spots. Cats love texture! Cover up the spots you don't want scratched with things your cat's paws wont like. You can use double-sided sticky tape, aluminum foil, or even a plastic carpet runner with the pointy side up. 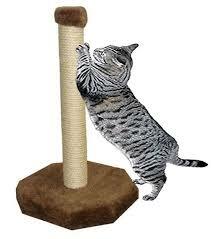 It may take some time for your cat to get used to only using the scratching posts. Be prepared to leave these objects in place for a few months. Once they are using the posts consistently, you can start to remove them one at a time. You can offer a variety of objects for your cat to scratch. An upright post covered in rope, a scrap of carpet turned upside down, a square of corrugated cardboard or even a log from outside, cats don't care. They are looking for a nice textured area to dig into. You can offer several options so they can choose a new spot each time. It can hang from the doorknob or lie on the floor. You can even rub them with cat nip to entice your cat to use them. Whatever helps to encourage them to these new spots. Be sure to praise your kitties when they use these new approved areas to scratch. This will reinforce the good scratching behavior your looking for. Where you set these new scratching posts and objects is just as important as what they are made of. Be sure to put them where your cat wants them. Start by offering a post on each level of the house. Place them next to where they sleep or near the spot they usually greet you each day. You can move them gradually over time if you like. Don't make any big moves at one time or they may go back to using your furniture or wood work. Remember, its important to never hit or yell at your cat in punishment. You don't want to make them afraid of you. If you catch them scratching on something you don't want, make a loud noise like clapping your hands. Then offer them the scratching post as an alternative object. Over time they will learn that the post is acceptable while the furniture is not. Your patience while your cat learns the new approved spots to scratch, will be rewarded with a more loving and peaceful pet.